This nutritional supplement offers the benefits of reishi, a mushroom with the scientific name Ganoderma lucidum. It is often described as the ‘mushroom of immortality’ because of its many therapeutic virtues for longevity which traditional Asian systems of medicine have been using for thousands of years. More recently, scientific studies have confirmed its many health-beneficial properties, including antioxidant, anti-tumour, anti-viral, antibacterial and cardio-protective effects. a peptide specific to reishi which has powerful antioxidant properties. Reishi’s medicinal effects have been the subject of a number of scientific studies which have demonstrated several anti-ageing properties for the mushroom. Its compounds help protect cellular DNA, mitochondrial DNA and the mitochondria themselves against the oxidative damage that causes cells to age. Its natural active principles also work by increasing the levels and activity of intracellular antioxidant enzymes such as superoxide dismutase (SOD), catalase and glutathione. This stimulating action helps both reduce oxidation of cell membranes and thus combat premature ageing of the cells. Lastly, reishi supplementation appears to promote the expression of a longevity gene which may help increase life expectancy. Alongside its anti-ageing virtues, reishi also has a positive effect on the immune system. Studies have shown it stimulates production of antibodies by B lymphocytes, as well as that of certain immune cells such as T lymphocytes and Natural Killer cells. It also promotes the specialisation and activation of dendritic cells and macrophages. All these functions help boost the body’s natural defences. Though it helps to stimulate the immune system, reishi also seems to inhibit certain immune responses. In particular, this inhibitory action may in some cases reduce inflammatory pain and allergic reactions. That is why some researchers believe reishi has an adaptogen effect and may act as an immune system modulator. 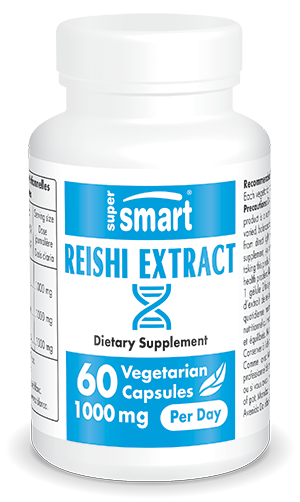 Reishi’s benefits are now available in the form of a dietary supplement. In line with our commitment to excellence, we have selected a high quality reishi extract, standardised to 20% polysaccharides and 6% triterpenes. The suggested dose for this natural health product is one to two capsules a day, although this can be adjusted in line with your needs and the advice of your therapist. To enhance the immune-stimulant effects of this mushroom, you may be interested in other natural supplements such as our shiitake mushroom extract and lactoferrin concentrate. There are also the anti-ageing supplements AC-11® and Resveratrol Synergy.